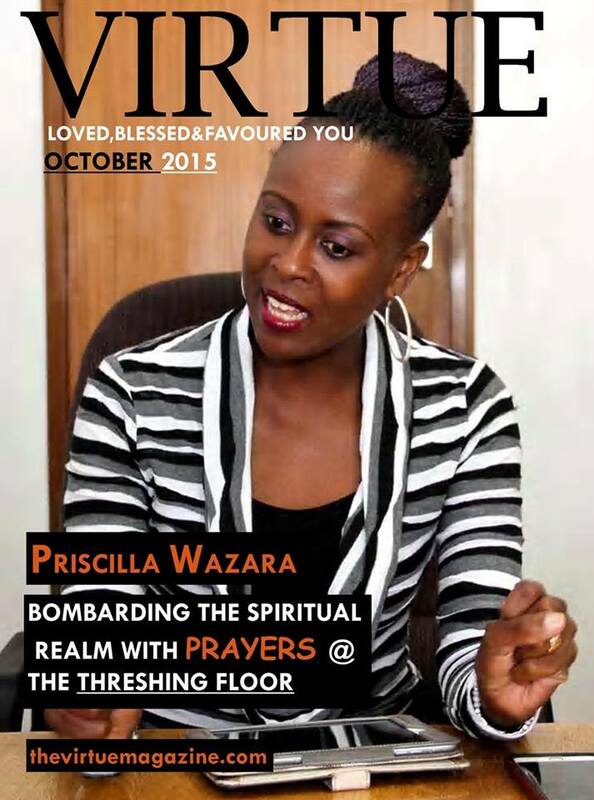 With a global mandate to promote and facilitate corporate prayers and fasting for believers, families and churches Priscilla Wazara has proved to be anointed for this call as evidenced by the fruits of her ministry…Threshing Floor Prayer Ministries. This exceptional teacher of the Word of God with a spirit of wisdom and understanding talks to Virtue on how to effectively increase prayer capacity across the nation, the God order of women empowerment and about the forthcoming ” ARISE DEBORAH – ARISE BARAK AND LEAD CONFERENCE “. 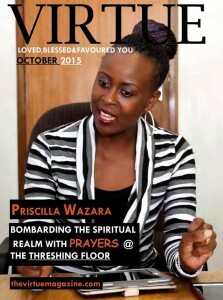 Q: Who is Priscilla Wazara, can you please tell us more about yourself? I am the last born of seven children, raised by my widowed mother who passed away in January 2000. I am married to Dr Matthew Wazara a surgeon and pastor. We have 4 children, three boys and one girl aged 22,19,17 and 15. We fellowship at Borrowdale Community Church, which is part of Faith Ministries under the leadership of Pastor Shingi Munyeza. Q: When did you receive your calling? I believe that God called me before I was formed in my mother’s womb ( Jeremiah 1:5 ) ,but I became aware of it when I was serving in a church I used to fellowship at in 1990 in London, England at Matthew Ashimolowo’s church. I served in the Praise and worship team. We used to have all night prayer meetings every Friday in our department. Q : Can you tell us about Threshing Floor Prayer Ministries, how did you start this Ministry? Four and half years ago I started a prayer group intending to meet once a month on a Friday afternoon. Thinking it would just be myself and three friends I had invited as a way of encouraging each other to grow in our walk with Christ. At that point I had no intention of starting a ministry of my own, since I believed I was already in ministry by serving in my local church. Nor did I have a clue that God would later call and assign me to pick this assignment called Threshing Floor Prayer Ministries. Q: How did people respond to your calling, did you face any resistance from family or friends? I was very reluctant to answer the call as I never felt qualified to do it, I still don’t but I choose to obey God. What I found amazing was that on the first day of the prayer meeting at my house ,fifteen ladies turned up excluding the three I had invited. I was baffled and till this day my three friends have not shown up for the prayer meetings. People who are not ministers themselves have been very responsive. My family and friends have been extremely supportive. Q: What are you hoping to achieve through Threshing Floor Prayer Ministries? To fulfill the mandate God gave us, which is to promote and facilitate corporate prayer and fasting for believers, families, churches, organization and the nation at large. Our goal is to make Zimbabwe a house of prayer for all nations and promoting prayer in homes and the market place. By recruiting and training prayer leaders across the nation we can effectively increase prayer capacity and set up 24hour watches throughout Zimbabwe. Q: What has been the main hindrance of spreading the Word of God in our modern time?. People have become desensitised to sin. People are blending in with the world instead of standing for the truth at all cost . Q: Where do you see Threshing Floor in the next five years? Hopefully firmly established and well represented in all ten provinces of our nation, only if it’s the will of God and not some egotistic notion I have to bring fame and focus to myself. God forbid, I desire to point people to Him only and not share His Glory. Q: You have a conference lined up can you tell us more about the conference? Yes TF has an upcoming conference themed ” ARISE DEBORAH – ARISE BARAK AND LEAD OPERATION SECRET PLACE “. It will take place at Borrowdale Community Church from the 19th to the 21st of November 2015. The first two days are for women only, this is because I believe God is calling women to come out of caves. Then on the 21st is the business seminar for both men and women, where Dr Shingi Munyeza will minister alongside Apostle Pearl Khupe. Others will minister on the importance and necessity of prayer in the market place. Q: Besides being in ministry what else do you do? I am a wife and a mother of 4 wonderful children. I have a degree in Sociology and Gender Studies and I am a qualified image consultant. I also run a horticulture business where I grow vegetables in greenhouse and supply supermarkets and restaurants. Q: What’s your take on women empowerment? I am for it because it increases the economic, social, educational and spiritual strength. Its origins is in the Bible. Have you heard or read about the daughters of Zelophehad in Numbers 21 v 1-8 . They were five sisters named Mahlah, Noah, Hoglah, Milcah and Tirzah who went to ask for their late father’s portion to preserve his name although this was unheard of in their culture because they were not males. But Moses brought their case before God and in verse 7 God said to Moses ” the daughters of Zelophehad are justified and speak correctly. You shall surely give them an inheritance among their father’s brethren and you shall cause their father’s inheritance to pass to them “. As long as we observe the order of God which is justice and empowerment of women along the lines of not surpassing His authority that man is the head of the home. Whether you are a CEO, at home you submit to your husband. Balance and obedience to His Word is how we should go about foundational. Q: What is the one thing that every woman should do for herself? Get an earthly and Godly education, thats the key for women’s success. Q: What is success to you and do you believe that you have achieved it? I believe that success is finding your purpose on earth as God ordained it in the BOOK OF LIFE in Heaven . You fulfil the destiny God created for you. Psalm 139 v 16 tells us that each person has a book in Heaven which contains your Kingdom purpose and destiny. No, I don’t believe that I have achieved it yet, but I am just grateful that through the Holy Spirit of God who leads, guides and counsels I have started the journey. Q: Two things you cannot go a day without? Apart from my family, it’s the Holy Spirit. The advocate, the helper who leads me daily as I try to navigate through life!. You have to meet Him, He is awesome. I spend time with my husband and kids mostly, as well as my siblings. I love to just lounge around at home, lie down and day dream. Q :What brings a smile to your face? Thinking about how God took an orphan who was orphaned at the of 3 and raised alongside 6 great siblings with no chance of having a favourable outcome in life. But God does the amazing and here I am today just counting my blessings and completely awed by His faithfulness to me. A scripture in Psalm 113 v 7 says ” He raises the poor from the dust and lifts the needy from ash heap “. That’s the God I serve, so I smile!!!. Q : What is the one thing about you that people would be surprised to know? Jeremiah 29 v 11 says ” For I know the thoughts and plans that I have for you, says the Lord, thoughts and plans for welfare and peace and not for evil, to give you hope in your final out come! “. Just as people have destinies so do nations. But what makes a nation is the people God put in it. I carry Zimbabwe in my heart and spirit, and would just want to encourage Zimbabweans not to loose hope. Hope produces faith to hold on until God fulfils every perfect promise concerning our nation. Be strong and courageous, walk by faith, do not be led by your emotions and circumstances. Easier said than done yes, that’s why we need to stay connected to the source of strength daily which is the Holy Spirit of God. We used to sing a song some years ago whose words were ” When I can’t see you I will not fear, I will trust in you and I will not be afraid. When darkness is closing in and I am running against the wind, I will trust in you and I will not be afraid “. Trust the Lord and stay under his covering which is the secret place. God is not a man that He should lie neither the son of man that He should repent. Hath He said and will He not do it? Or hath He spoken and will He not make it good. ZIMBABWE SHALL BECOME THE BREAD BASKET OF AFRICA . Q : Where can people reach you?